Junior guard Jarrey Foster will miss the rest of the season with a torn ACL. Two SMU basketball players will miss the rest of the season with injuries, Tim Jankovich announced Monday. Junior guard Jarrey Foster has a torn ACL and freshman forward Everett Ray has a broken foot, Jankovich said at “The Fast Track” Monday night. 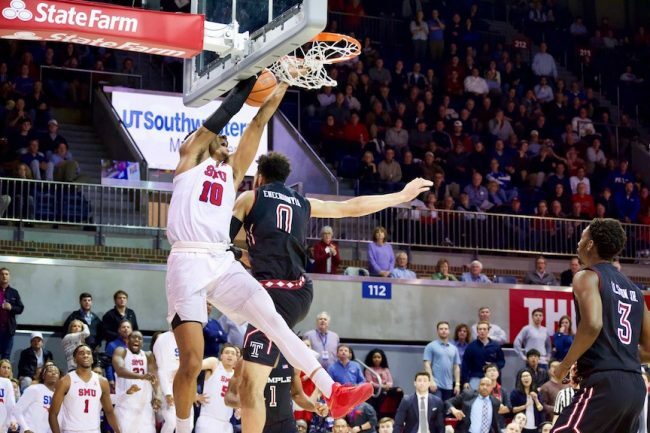 Foster went down with a left knee injury while going for a layup in SMU’s win against Wichita State Wednesday. He was one of SMU’s best players, averaging 13.2 points, 5.9 rebounds and 2.7 assists per game. He also provided valuable versatility on defense, covering players inside and outside the arc. Jahmal McMurray took his place in the starting lineup Saturday, and will stay there for the foreseeable future. Ray was averaging 2.3 points and 2.7 rebounds per game before breaking his foot in warm-ups before SMU’s win over Tulane on Saturday. Ray had missed time with a sprained ankle earlier in the season. He was one of SMU’s three “big men,” along with Akoy Agau and Ethan Chargois. SMU is now down to eight eligible scholarship players, but the Mustangs have been here before. They won the AAC with just seven scholarship players last year. The team’s next test is road game in Connecticut against UConn Thursday night.